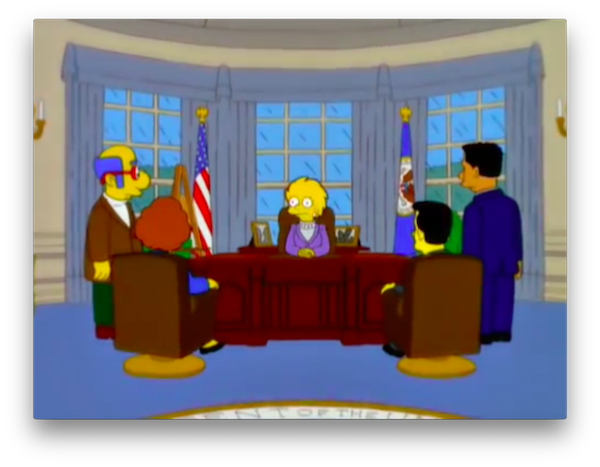 It’s come to many Simpsons viewers’ attention that the Fox cartoon is eerily prescient when it comes to future events. Like, they’re scarily good at it. The show’s most recent prediction to come true is from the 2012 episode “Lisa Goes Gaga,” in which Lady Gaga performs in Springfield. The pop star jumping off a platform and performing while suspended is eerily similar to her performance at this year’s Super Bowl. 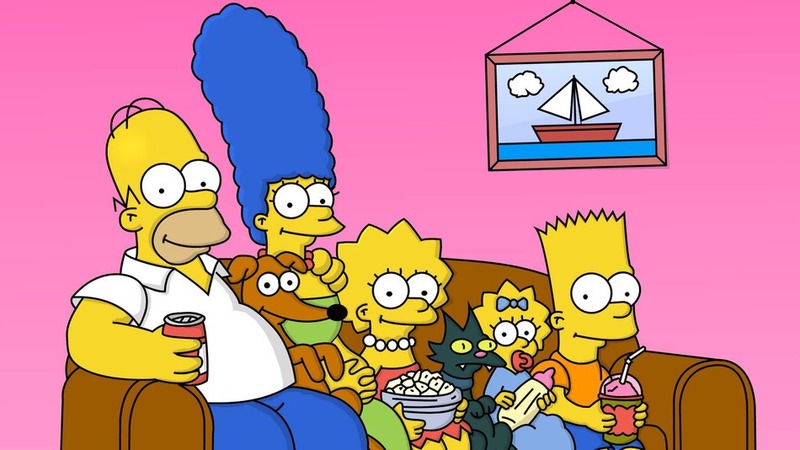 Perhaps the most frightening prediction is one made in the episode “Bart to the Future,” in which now-President Lisa Simpson mentions the budgetary nightmare President Trump left them. The fact that the episode aired in 2000, before the 2016 election was a glimmer in Trump’s eye, is the scariest aspect of this prediction. Soccer governing body FIFA is not especially known for its clean business practices, but it wasn’t until March 2015 that any FIFA officials were arrested. 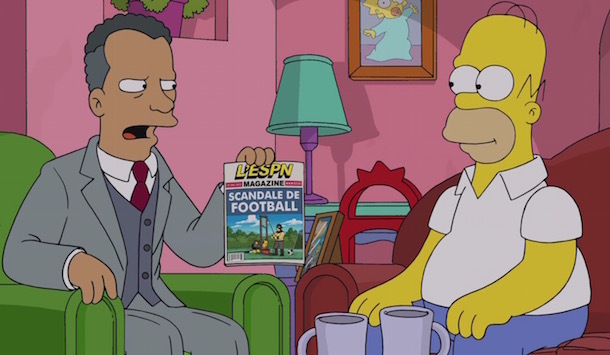 In the 2014 episode “You Don’t Have to Live Like a Referee,” Homer meets with an official from a certain soccer governing body (FIFA is not explicitly named but is definitely implicated). Halfway through the official’s explanation of the organization’s corruption, he’s handcuffed and carted away. Although Greece’s financial woes have been around since at least 2009, the 2013 episode “Politically Inept with Homer Simpson” approached the idea of a Greek bailout with the idea of Europe selling it on eBay. If you took even one step outside in December 2014, you were inundated with cries of “Ebola!” and “Monkeys!” and “Have you traveled to West Africa recently? If so, please get as far away from us as possible.” Overall in the United States, there were 11 treated cases of Americans with Ebola. 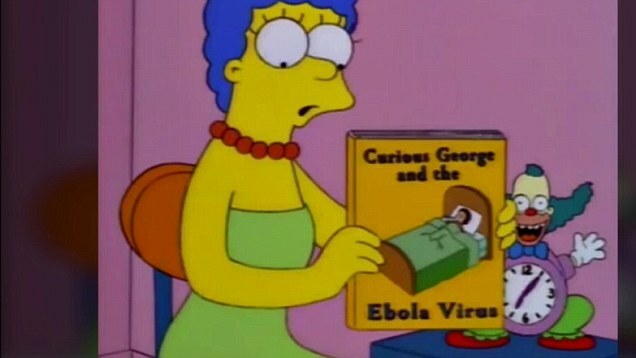 In the 1997 episode “Lisa’s Sax,” Marge reads Bart a bedtime story entitled Curious George and the Ebola Virus. Very dark, very on-the-nose, very creepily accurate. 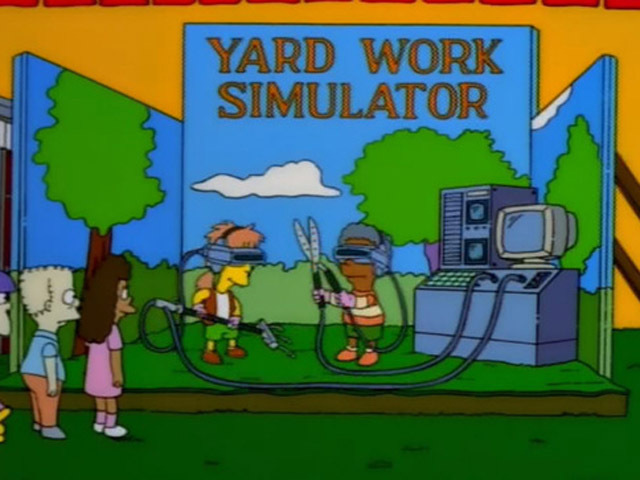 Predicting Farmville, everyone’s favorite waste of time in the late 2000s, the 1998 episode “Bart Carny” features a Yard Work Simulator when a carnival comes to Springfield. Anyone else flashing back to constantly deleting notifications after you’d stopped playing it? Don’t be distracted by the red circled name. 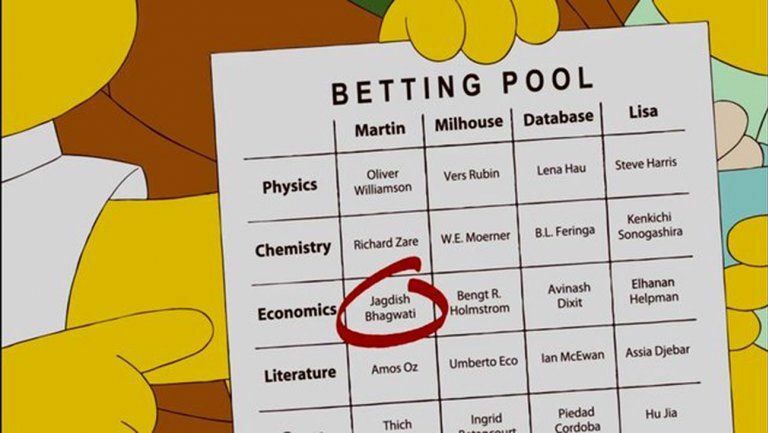 When the kids placed their bets on who would win the 2010 Nobel Prize for Economics in the episode “Elementary School Musical,” it’s Milhouse who was right: Bengt Holmstrom won the prize in 2016. Almost 20 years before it was revealed that some meat sold in Europe contained horse — sometimes up to 100 percent — The Simpsons was on the case. 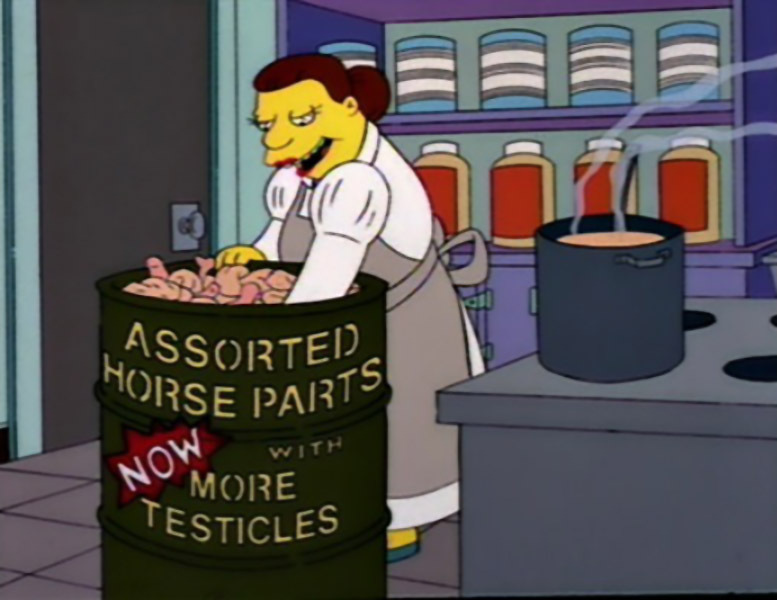 In the 1995 episode “Sweet Seymour Skinner’s Baadasssss Song,” Lunch Lady Doris is shown to be cooking with assorted horse parts. Yum. If a Pennsylvania voting booth being decommissioned for not allowing its users to vote for Barack Obama in 2012 sounded familiar when it happened, it’s because Homer Simpson had the exact same problem in 2008. 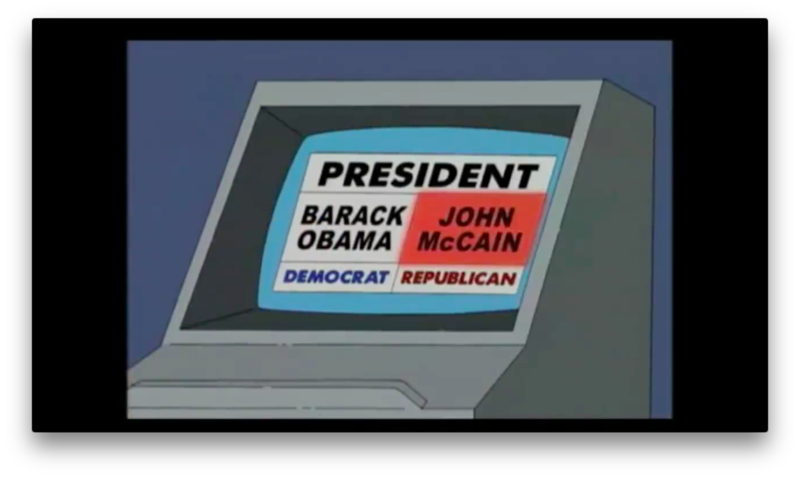 In the show’s 19th “Treehouse of Horror” episode, Homer attempts to vote for Obama multiple times, each time racking up another vote for John McCain. 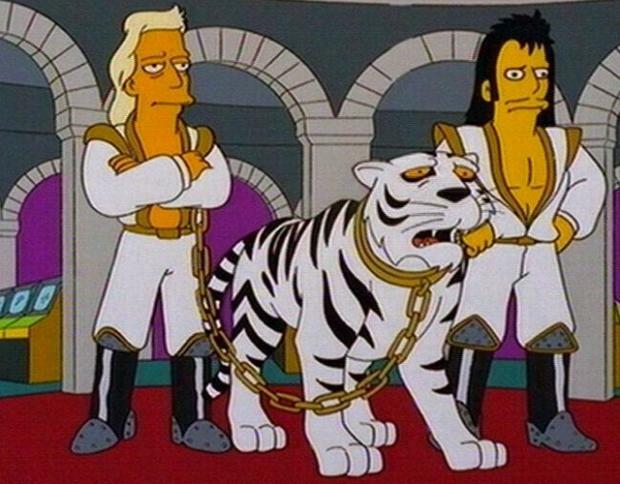 When Roy Horn of magician duo Siegfried and Roy was attacked by their tiger in Las Vegas in 2003, it was quite a shock — if you hadn’t watched The Simpsons a decade earlier. In the 1993 episode “$pringfield (Or, How I Learned to Stop Worrying and Love Legalized Gambling),” a member of a different German magic team, Gunter and Ernst, was mauled by a white tiger in their act. Maybe let’s just avoid tigers in magic acts altogether, shall we? While Homer Simpson is known for being good at many things — donut consumption, for example — he’s not particularly famous for his math skills. However, in the 1998 episode “The Wizard of Evergreen Terrace,” he’s shown working out a complex math problem on a blackboard. 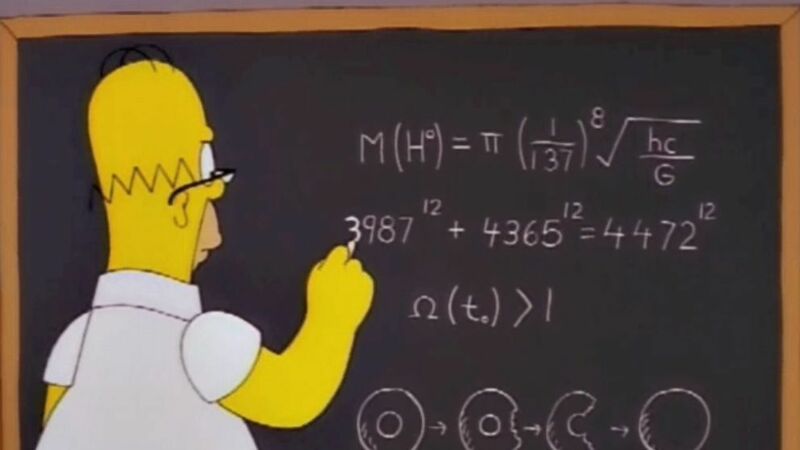 According to Simon Singh, author of The Simpsons and their Mathematical Secrets, the equation Homer’s working on is eerily close to the actual mass of the Higgs boson particle, which wasn’t discovered until 2012.